In 1964, Ray Donlon, a 30-year-old Special Forces soldier, was sent into the thick of the jungle in Vietnam. It was his first deployment, but he and the 11 soldiers on the team he was leading had been well-trained and well-prepared. 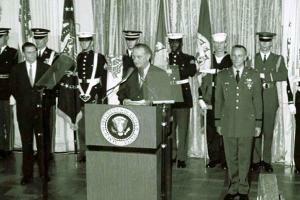 The soldiers were sent in as advisors to the South Vietnamese. Their job was to train and equip them to fight off the Viet Cong. The men were excited, as young men are when they travel to a new country, a new culture, and they were filled with hope that they were going to be able to help people help themselves, the now-80-year-old said. They knew the risks: they could be killed, or, perhaps worse, be captured and taken as prisoners of war. “We all vowed to each other we would fight until the end,” he said. On July 6, just six weeks after the team arrived, they faced that test. In the cover of night, about 800 or 900 Viet Cong ambushed the camp at Nam Dong about 30 miles west of Da Nang. The team was far-outnumbered with half or more of the 300 South Vietnamese they were working alongside turning to fight against them. Even though the odds were stacked against them, the men of the 7th Special Forces Group hunkered down to fight. They rescued their ammunition from a blazing building and began to take positions around the camp. Donlon dashed to the main gate, shooting down the men who were trying to use explosives to blast their way through. Many men were wounded in the initial onslaught of heavy gunfire, falling grenades and exploding mortar shells. Despite a severe stomach wound and being shot in the shoulder, Donlan continued fighting and working to evacuate the injured men. They had lost radio contact and so Donlon moved from position to position, hurling hand grenades as he went. “I was reassuring each member of the team that we were still a fighting force,” he said. They began to take casualties. Sgt. John Houston was killed and Master Sgt. Gabriel ‘Pop’ Alamo died in Donlon’s arms. Australian Warrant Officer Kevin Conway, who was also at the camp, became the first soldier from his country to be killed in action. In the light of day, after five long hours of battle, the team was victorious. They had held onto the camp. For his work inspiring his men to “superhuman effort,” Donlon received the first Medal of Honor of the Vietnam War. But, he wouldn’t be the same. After receiving that award, he wasn’t supposed to be sent back to the same combat zone, but he weaseled his way back in. Late last month, with the 50th anniversary of the battle near, Donlon, who lives in Kentucky, and three surviving members of his team were honored at the 7th Special Forces Group (Airborne)’s annual dinner. Before the dinner, he said everyone carries wounds of war, some visible, some not. He hopes sharing his story will help some of today’s soldier’s fight off discouragement. The 7th Group named their headquarters building at their compound near Crestview after Donlon — “a complete surprise,” he said — and other locations after the men who fell in the battle. He believes that’s a step in the right direction of honoring their memories.